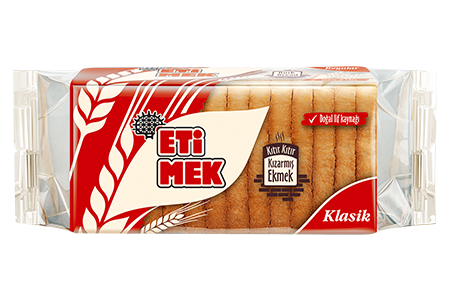 There is a name given to ready packaged toasted bread in Turkey for years: Etimek. Etimek Classic, a classic product from ETİ like its name, is the first and only domestic brand in its category. Etimek is always available in the kitchens of the ones giving importance to healthy diet from the first day of coming onto the market. The reason is that it gives flavor to delicious desserts and salty snacks made by the ladies with their creativity. It gives flavor not only to the recipes! Etimek adds taste to every meal from breakfast to dinner, by spreading butter-honey on it or putting in the soups. It is also practical.